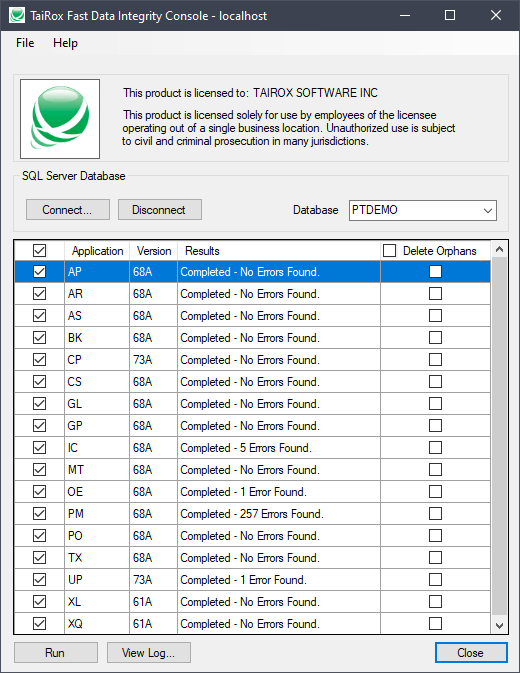 Available for $595 + $120 per year, TaiRox Fast Data Integrity is a SQL Server specific utility that performs Sage 300 integrity checking in a fraction of the time taken by the standard Administrative Services function. Tests on large databases show 100x-1000x performance gains. AP, AR, AS, BK, CP, CS, GL, GP, IC, OE, PO, TX, UP and TX applications are tested. Some cross-application checking is performed. 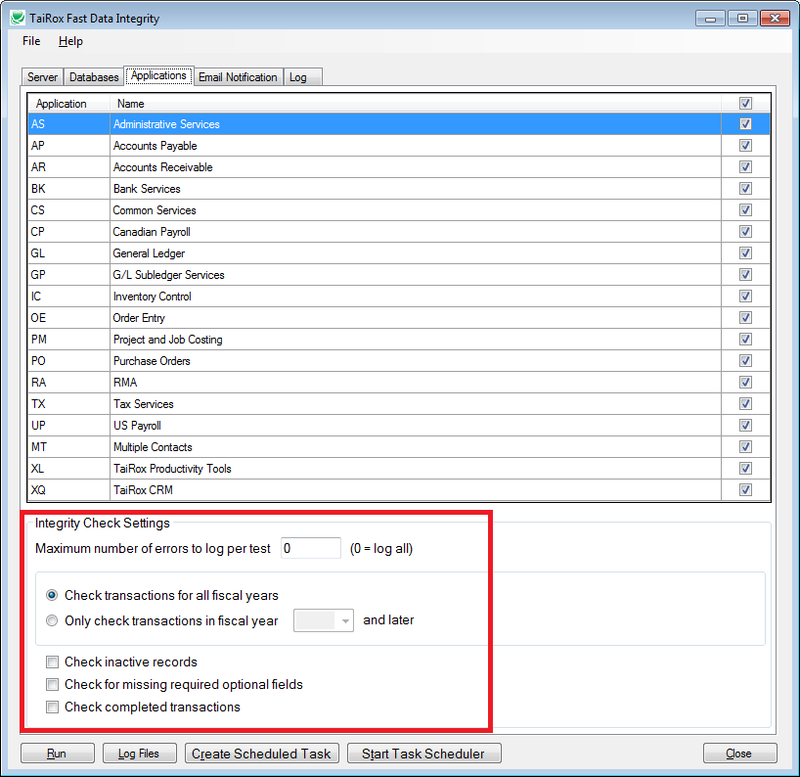 New: Extensive checks for valid users have been added, many of which are in a new Administrative Services module. "The native data integrity ... took over 3 days ... Fast Data Integrity ... less than 1.5 hours." Bruce Warrell, NextLevel Information Solutions. Show complete quote. "Subject: Re: Fast Data Integrity ... Darn that thing is fast !!!!!" Paul Field, Net@Work. Show complete quote. Fast Data Integrity is designed to be run as a Windows Scheduled Task and can check multiple Sage 300 databases in one job. Sage 300 must be installed on the computer. Fast Data Integrity Console is interactive and will (optionally) delete orphans that it detects. It is not necessary to install Sage 300 on the computer running the Console. • Checks data integrity of large databases 100x-1000x faster. • Console will delete orphans that are detected. • Eliminates noise from error log - old errors that will not be corrected. • Helps insure that BI and Crystal reports are accurate.